You wake up on a Sunday morning, it’s a beautiful day, so you decide to wash your ride. What products are you going to use to tackle this project? Are you going to wax the vehicle? How about those dirty wheels, how do you get them clean? Maybe it’s time to throw away all those fast food wrappers and bags inside the car and vacuum and clean the interior too. I’ll show you what products I use to get the job done right and give your car a shine that you can be proud of. I personally find it so much more enjoyable driving a well cleaned and detailed vehicle than a dirty one. First off your going to need to pick up the right products. I have tried alot of different auto detailing products. 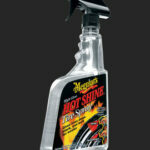 Meguirs is by far the best car detailing products on the market. They make a complete line of products specifically designed for every part on your vehicle. Wheels, body, interior, trim, headlights and more. I know what your thinking, “Do I really need to buy different products for each part of my car”? The answer is YES, and no, you cant just use one product and expect your car to look great. Brake dust on the wheels is not the same as dirt on your hood. And all waxes are different, trust me on this one. 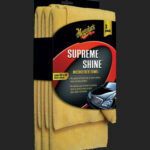 There are waxes specifically designed for lighter colored cars and darker colored cars. You wouldn’t want to use “black wax” on a white car and vice versa. Added products and materials that will be need are tire cleaning brush, window cleaner, and paper towels. And also a wax applicator such as a waxing buffing pad. Both the Black Wax and White Wax come with a wax applicator. To be perfectly honest, I rarely use a water hose and a bucket of soap on my car. I only use water on the wheels by spraying them with a hose to rinse them off. It’s not necessary to hose the whole car down and its just takes twice as long to wash the car. The products above do the job without using a hose. The key here is to make sure you have plenty of clean Microfiber Towels to use. Only use Microfiber Towels! 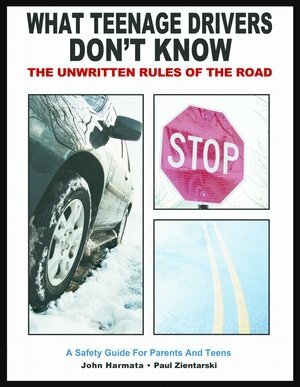 Any other towel will scratch your vehicle and/or leave swirl marks, which is never a pretty site to see on your ride. I use at least 5 towels on a full detail. Always do your wheels first! This way any spray you get on the body can be wiped off later. Spray the aluminum wheel cleaner on the wheels. Only use the “Aluminum” Wheel cleaner (Blue Liquid). 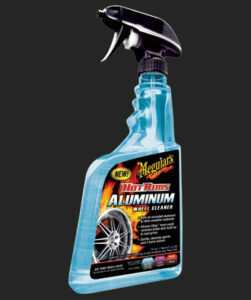 DO NOT USE MEGUIR’S HOT RIMS ALL WHEEL CLEANER (Pink Liquid). The Pink liquid will eat your aluminum rims and leave spots that don’t come out. Sorry Mequir’s, I had to tell them……..and you really need to stop making that Pink Liquid stuff. Take a small brush with soft plastic bristles, or use a wheel brush that you can buy at any auto parts store, and lightly scrub the wheels. DO NOT USE A WIRE BRUSH, Hose off the wheels until the cleaner is removed, than wipe down the wheels by hand using one of the microfiber towels. After the wheels are dry apply Tire Spray to the sidewalls of the tires. DO NOT SPRAY DIRECTLY ON TIRE. You do not want to get the silicone based spray all over your newly cleaned wheels or all over the body of the car, it will leave spots. Spray Tire Spray onto a towel, or I prefer using a car waxing buffing pad, then apply to tire. Slowly move around the tire until tire has glossy look you are happy with. Do all 4 tires and lets move on. Clean all the exterior glass. The reason you are cleaning the glass first is because the window cleaner will spray on the body of the car, and since we haven’t washed the body yet, no big deal. I’m not going to tell you how to clean your glass here, just clean them the way you want. Window Cleaner and paper towels seems to work for us all, so go for it. Get those Microfiber Towels ready, your going to need them. Time to do the body. 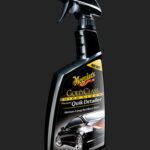 Spray the Meguir’s Gold Class Quik Detailer on a panel and wipe off with the microfiber towel. Only do one panel at a time. Example, passenger fender, passenger door, roof, passenger quarter panel, trunk, rear bumper, drivers quarter panel, drivers door, roof again, fender, hood, then the front bumper. Be sure to flip and fold that towel to use clean portion of the towel. As soon as he whole towel is dirty, grab a new towel. There, now wasn’t that easier than grabbing a bucket of soapy water and having to dry the car off. The car should pretty clean after this step, but we are not done yet. It’s time to bring the paint to life with a coat of wax. 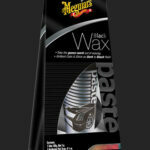 Use the Black Wax if you have a dark colored car, use the White Wax if you have a light colored car. 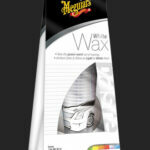 Use the applicator that came with the wax and begin to wax the car. I personally will wax 3 panels at a time. You want the wax to dry a bit before you wipe it off. This will leave less chance of swirl marks and the wax will come off very easy. Use a clean Microfiber Towel to remove the wax. Once the towel is dirty, replace it with a new one. Wax the entire car and stand back and marvel at what you have done. Now you see why you did the glass and wheels first. The body is easy to do without the use of spraying water everywhere, and if you follow these steps you will not have to worry about spots on the paint from wheel cleaner or glass cleaner because you did that first. Outside is done, time to wipe down the interior. Vacuum out the car. Clean the interior glass with your glass cleaner. Now grab your interior wipes. 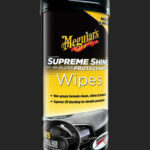 I prefer the Supreme Shine wipes, but if you don’t like your interior to have the “shiny” look, you could also use the “Natural Shine” wipes or the plain “Quik Interior Wipes”. Wipe down the dash, center console, and interior doors. You basically want to wipe anything that is plastic with the wipes. If you have cloth interior, congratulations, your car is clean and detailed nice, skip step 7. Leather interior people, we have one more step to go. Grab your Leather Wipes and wipe down the seats. 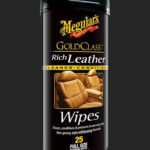 Meguir’s Leather Wipes will help to keep your leather from fading and cracking, and also leaves the leather looking shiny and new. So there you have it, you just washed and detailed your whole car, and you did it without the use of a bucket of soap and spraying water all over the place. If you followed all these steps, and used all these products, then I can pretty much guarantee this is the best your car has ever looked! Don’t thank me, thank the good company of Meguir’s. Now that your car is clean, how do you keep it that way? Simple, follow these steps with the rest of our products from the above list. As you notice your vehicle starting to get dirty, use either Meguir’s Ultimate Quik Wax or Meguir’s Premium Gold Class Quik Wax to touch it up. I personally use the Gold Class Premium Quik Wax. I have a black car and I like the finish it leaves. I suggest experimenting with both to see which one you like. 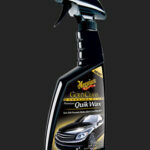 Grab a clean Microfiber Towel and spray the dirty panel with the Quik Wax and wipe off. It’s that easy. Paint is clean and looking good again. Hope you enjoyed the article and your car is looking it’s best. DISCLAIMER: I do not work for Meguir’s nor am I paid by or sponsored by or receive any compensation for endorsing their product. I’m strictly a consumer who really appreciates their products and strongly believe that they are the best automotive detailing products on the market today.